I moved to Portugal. Well, kind of. If we’re being perfectly honest, I’m staying in Portugal as long as legally possible without declaring residency, because soon I go back to Germany, then go live on a floaty boaty cruise ship for five months, and THEN I will come back to officially live in Portugal. Perfectly clear, yeah? oof. My brain is a mess of languages, and my heart feels like it has no homeland, but we’re working on it! So how did I end up here? Well, one year ago I had the great pleasure of road tripping across Europe with this guy who decided he was moving to Ericeira, Portugal, a little pocket of creative perfection northwest of Lisbon. The road trip was an adventure worthy of its own post (coming soon) but as soon as we pulled in to the parking lot of Ericeira’s old town, I knew I was in love. 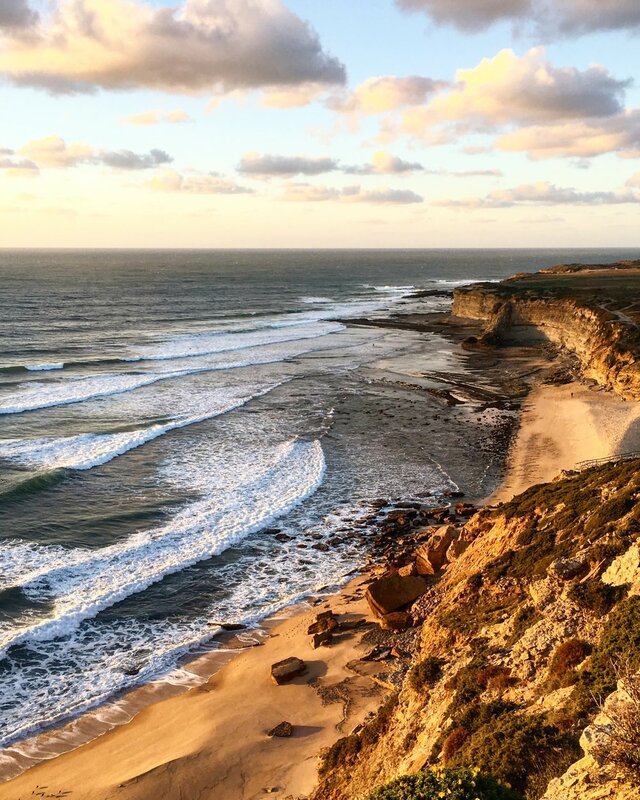 Imagine the movie set of “Mamma Mia” speckled with cafes serving oat milk lattes and açaí bowls, where freelancers meet to discuss their newest graphic design project, and you’ve landed in Ericeira. Live music echoes through the old cobblestone streets and the population is an interesting mix of authentic Portuguese grandmas and young, creative surfer types. It’s a magical little place, and it didn’t take me long to realize a piece of my heart now belonged to Portugal (and my road trip partner). After a few more visits for various amounts of time, I started to entertain the idea of moving to Portugal. To be honest, saying it out loud was the scariest part. I knew in my heart I wasn’t happy in New York anymore, but moving to another continent didn’t seem like the sensible solution. Most people would go to a new yoga studio, change their neighborhood, or see a therapist. Fleeing to another continent is another level. Do I speak Portuguese? nope. Did I have a plan for a job? also no. But something about the idea still felt promising, and filled my soul with some much needed fresh air and light. I think as Americans, we’re taught that taking risks that defy the norm of the “american dream” are reckless and irresponsible. The most common question I got from family and friends when I told them I was moving was, “what are you going to DO there?” (Strong emphasis on the “DO.”) Listen, it’s a valid question, I’m not that naive. But if I said I was moving to California, Austin, or even Vermont, I don’t think the concern about what to “DO” would be as strong, because it’s America, and we move for jobs and that’s about it. I felt surrounded by a culture of “live to work” and I wanted out. To be clear, for the past year I’ve been working for a German cruise line as a singer, and I truly love my job. I don’t want to be classified as a lazy millennial on a quest for an easy life with minimal effort. Hard work was engrained in me from a young age, and you’ll be hard pressed to find a more prepared person than me on the first day of rehearsals. But juggling three jobs in New York felt a bit more like drowning than hard work. Working on a cruise ship is definitely not a forever job, but it opened my eyes to the different priorities that guide people. Every crew member is there to work hard, that’s a given. Some are there to climb the ranks and earn their stripes. Others are there to send money back to their home country where the economy is in shambles. But everyone is there to travel. Everyone has made the “reckless, irresponsible” choice to see something outside of their comfort zone. And most days, it’s a thrilling adventure. So how do I live life, waking up every morning with that sense of adventure, without living on a cruise ship? Well, for me, it’s waking up in a 200 year-old flat filled with blue and white tiles, tucked away on a cobblestone street in Ericeira, Portugal. I take out the trash and pass the fisherman hauling in the catch of the day at “Praia dos Pescadores” and grab the morning bread (20 cents) from Isabel’s mini market next door. Not every day is a fairytale, but I feel lucky that the odds are usually in my favor. Everyone’s journey is different, and I think the thing I learned most from having three unique, beautiful sisters is that the definitions of happiness and success are wildly different for each person on this earth. I don’t have a solid, American answer for what exactly it is I’m “DO ing” at the moment, but something about my happiness level tells me I’m headed in the right direction. My first, and favorite, Ericeira bar.